An Electric Car Guest Drive event will be held in Burbank CA on January 12, 2019. The Electric Vehicle event will feature a wide variety of electric cars including the new Tesla Model 3, Model S, Model X, Chevrolet Bolt and Volt, the all-wheel drive Mitsubishi Outlander PHEV, BMW i3, Nissan Leaf and other electric cars. An Electric Car Guest Drive event hosted by OUC will be held at Camping World Stadium in Orlando, FL from 10am to 4pm. The electric vehicle (EV) event will feature a wide variety of electric cars including the new Tesla Model 3, Chevrolet Bolt and Volt, and electric cars manufactured by BMW, Nissan and others. The event sponsors is OUC, Orlando Utilities Commission. Register to receive an invitation and more information about the event. EV Quorum and the Sacramento Electric Vehicle Association (SacEV) met at Sacramento’s Southside Park on Memorial Day. Located in a quiet downtown neighborhood with large expanses of green lawn, Southside is considered one of the best parks in Sacramento. The normally bustling downtown was quiet in the state capitol, and meters for the slant street parking surrounding the park were on holiday with the rest of the state and municipal workers. A Tesla Roadster and three Tesla Model S sedans were the standouts among the lineup which also included two Fiat 500e, a Chevy Volt, Ford Focus Electric, Honda Fit and Smart ED. St James Park has a pretty rough reputation as the site of a permanent homeless encampment. But upon seeing fellow travelers with tents, the park residents graciously made plenty of room for us and we staked out our patch of grass in the corner with four teardrop flags and a row of feather flags along the sixteen parking spots that had been reserved for us. EVs on display and available to guest drive that day included the Tesla Model S, Smart ED, a pair of Chevrolet Sparks, Toyota RAV4 EV, Fiat 500e, Ford Focus Electric, Honda Fit EV and a plug-in Prius. The EV Quorum and North Bay EAA meet-up in Santa Rosa spanned three generations - of EVs and attendees. The gathering featured eleven electric cars produced from the twentieth century to present day, representing three distinct phases of the EV revolution. The elder statesmen were the two immaculate Ford Ranger Electric trucks that looked as good as the year they were originally produced: 1999. The second generation was represented by a beautiful "thunder grey" Tesla Roadster, a model which Tesla began producing in 2008 and which instigated the rebirth of the modern EV era. A small community park conveniently located next door to Public Market in Emeryville was the site of the Electric Car Guest Drive meet-up between members of the EV Quorum and East Bay Electric Auto Association car clubs. Thanks to Dean Cornell, president of the EBEAA, for orchestrating a great turnout from the club. Dean has been charged with recruiting the new generation of EV drivers, pardon the pun. Jordan Bloch's video documentary of the Electric Car Guest Drive resumed at full speed Sunday after EV Quorum pitched the lightning-bolt canopies in a line under the shade of the enormous trees in Santa Monica's Clover Park. Russell Sydney commented that the ECGD Clover park location was "hallowed ground" due to its historical significance as the site of one of the earliest advocacy and activism events for electric cars in Santa Monica. The Thousand Oaks Electric Car Guest Drive drew four Tesla Model S performance sedans to the gathering, calling for a show which revealed a pair of Chevy Volts, a Nissan Leaf, Fiat 500e and Ford Focus Electric. Noted director Jordan Bloch began shooting his video about the Electric Car Guest Drive. Russell Sydney, lecturer and author of the book “Energy and EV Secrets” brought his Chevy Volt and shared some history of the SoCal EV scene. The Electric Car Guest Drive event held in Newport Beach near Irvine at Bonita Canyon Sports Park reflected the laid back vibe of the tony beach city. Educational reps from Verengo Solar shared the spirit of ahoha in a dialog that weaved a deeply felt philosophy of care for the earth and ocean throughout the daylong discussion of the technical how-to of fueling your car on sunshine. A sincere mahalo to the braddahs from Verengo who spent the afternoon with EV Quorum. 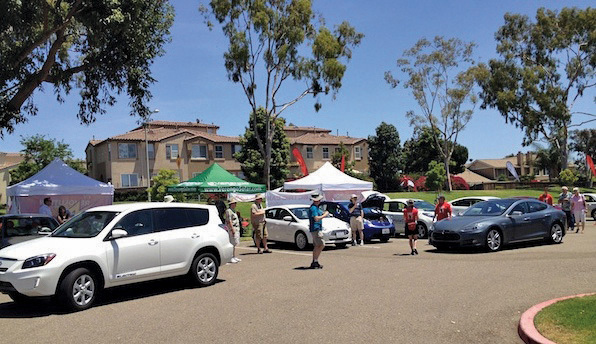 The weather was picture perfect in Chino Hills as members of EV Quorum and Electric Vehicle Association of Southern California (EVAoSC) pitched canopies at Ruben Ayala Park. I was certain that the Cadillac ELR would be the novelty of the day until EVAoSC member “Electric Bill” Dale, a dead ringer for Gandalf, straight from the Shire right down to the the mischievous twinkle in his eye and impromptu magic tricks, glided up in a perfectly restored 1999 Corbin Sparrow. It seemed a perfectly fitting ride for a wizard. Newly outfitted with Lithium Ion cells, the personal transporter was a reminder of both the longevity of electric vehicles and how far EVs have come in the past 15 years. Learn everything you need to know about electric vehicles at San Diego EV Day. Drive a battery electric or plug in hybrid and learn how to much money you can save fueling your car with electricity instead of gasoline. Also learn about the financial incentives available on the purchase or lease of an EV. You can register here to test drive vehicles. Just under 200 people attended the San Diego Electric Car Guest Drive event the weekend of May 3-4, held in Balboa Park and Calavera Park. Nine different types of EVs were available to drive, eleven EVs total. The club also had two conversions on display, an award winning VW Beetle and a Pontiac Fiero dubbed the "Silver Bullet". An Electric Car Guest Drive event hosted by KCPL will be held at Penn Valley Park from 10am to 4pm. The electric vehicle (EV) event will feature a wide variety of electric cars including the new Tesla Model 3, Chevrolet Bolt and Volt, and electric cars manufactured by BMW, Nissan, VW, Volvo, and others. The event sponsors is KCPL, Kansas City Power and Light. The Monterey Electric Car Guest Drive was held in beautiful Veterans Memorial Park a forested area which, although just a mile from town, made us feel like we were deep in the woods on a campout. Julie immediately voted it her favorite venue for the electric car meet-up. Sharon Sarris, founder of the Monterey Bay Electric Vehicle Alliance, brought her black Chevy Volt which looked like a polished bit of Apache Tear glittering in the sun.